Not all turnout gear is created equal. 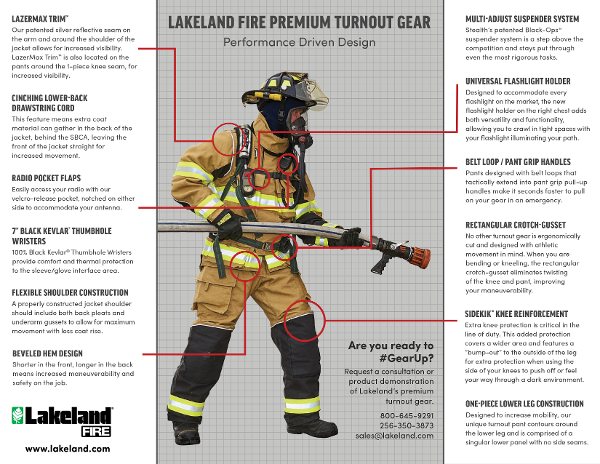 At Lakeland, we understand the nature of tough days on the job and we've designed turnout gear that maximizes both comfort and performance. And, because we understand that the little things can make a big difference in an emergency situation, we've added new features that come standard. Take a closer look at some the superior design features Lakeland’s Stealth™ Premium Turnout Gear has to offer. LazerMax Trim™ Our patented silver reflective seam on the arm and around the shoulder of the jacket allows for increased visibility. LazerMax Trim™ is also located on the pants around the 1-piece knee seam, for increased visibility. Flexible Shoulder Construction A properly constructed jacket shoulder should include both back pleats and underarm gussets to allow for maximum movement with less coat rise. Multi-Adjust Suspender System Stealth’s patented Black-Ops™ suspender system is a step above the competition and stays put through even the most rigorous tasks.